This are very important because they make it possible for the user to make calls to any person that is located within the country as well as receive calls from people located in the country. With the Direct Outward Dialling (DOD), business offices can make calls to the outside world without facing any problems which makes running of business activities very easy. With Direct Inward Dialling, people running office businesses are able to receive calls from the outside world without any problems. This is another thing that makes running of business very easy and effective. The pilot number is very important since it enables each and every user to have just a single number for the purpose of billing and board line. This makes it easy to remember since you only have to remember a single number. This is where each and every employee gets a single number from which they can be called by different people. video, voice and data applications use this feature. It is therefore very important in each and every premise that has such applications. Handle wide range of Transmission speeds (64K /128K), 5 to 6 times faster than analog lines therefore lower usage cost. Few pairs of copper, hence higher reliability. Applications that are widely used on ISDN. Digital Telephony. Concurrent use of any two applications like fax, data, voice, video conferencing. Electronic Data Processing. Data Transmission on LAN & WAN. Control Internet usage by allocating band width on a pay and use basis. Enjoy the benefits of instant access on voice and Net. We are capable of providing a single bill across the country. This includes services on wire line in multiple locations within the country. This is a feature that makes it possible for you to have a board number that is not only local but also very unique and similar. This allows you to give different people the same number making it easy for them to contact you at any time. This is very important both for personal and business purposes since it makes connecting with different people very fast and easy. It is one of the features that make having a PRI phone system very important. 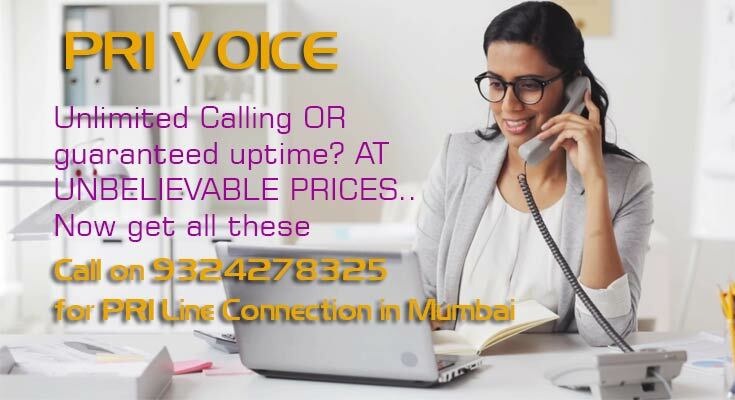 Pushti Web and Software Solutions is authorized channel partner in Mumbai of Tata Tele Business Services who provide industry first SLA backed Primary Rate Interface (PRI) service provides 30 voice channels on a single link with the capability of upscaling number of channels as per future requirement. These can be configured as incoming, outgoing or two-way communication channels. Our PRI services provide a full featured, 2-way connectivity between ISDN compatible PBX or Key System and the Public Switched Telephone Network (PSTN). Our SLA-backed PRI line and connection offers an enterprise access to a telecom infrastructure that can dynamically adapt to the changing needs of their business. Our unmatched SLA offering includes : Network service availability of 99.5%, a complaint MTTR( Mean time to resolve) of 4 hours and Service credits in case of commitment breach. Who can use PRI as a solution? Individuals who are running a call centre who deal with Automatic applications for call distribution. 2 Way Channels- This are very important because they make it possible for the user to make calls to any person that is located within the country as well as receive calls from people located in the country. Outgoing channels- With the Direct Outward Dialling, business offices can make calls to the outside world without facing any problems which makes running of business activities very easy. Incoming Channels- With Direct Inward Dialling, people running office businesses are able to receive calls from the outside world without any problems. This is another thing that makes running of business very easy and effective. Pilot number- The pilot number is very important since it enables each and every user to have just a single number for the purpose of billing and board line. This makes it easy to remember since you only have to remember a single number. Direct Number- This is where each and every employee gets a single number from which they can be called by different people. PRI signalling- video, voice and data applications use this feature. It is therefore very important in each and every premise that has such applications. Single Bill for multiple locations- Our PRI Line is capable of providing a single bill across the country. This includes services on wire line in multiple locations within the country. Board number that is similar- This is a feature that makes it possible for you to have a board number that is not only local but also very unique and similar. This allows you to give different people the same number making it easy for them to contact you at any time. This is very important both for personal and business purposes since it makes connecting with different people very fast and easy. It is one of the features that make having a PRI phone system very important. National Pooling for voice services –This feature enables you to pool the minute usage across the rate plans. This is very important for every user because it makes it possible to adjust and cover less utilization for one product, location or service and at the same time utilizing another location product or service without having to lose or pay for additional value. Digital Quality– We live in a digital world. For this reason, it only makes sense for your voice quality to be digital. A digital voice kind of quality is very important because it enables you to hear things loud and clear and also prevents unauthorized people from tapping since it is tamper proof. This is not only important for users but also very important for every person in business who makes and receives calls on a daily basis. The calls are not only protected from tapping, but the business communications are clear which makes running of the business easier. Service availability is enhanced- Availability and performance of service is something that is very important when you are choosing a PRI phone service. This is because you need a PRI phone system that is stable and does not fail from time to time. This is why Bridgei2p are the best PRI service providers in Bangalore. Their performance and availability is highly reliable. They have a high quality fibre optic cable that has a ring architecture that enables quick fix to failure automatically. Less wires- The other reason why Bridgei2p are the PRI service providers in Bangalore is the fact that they include very few wires in their PRI phone system. This not only makes it easy to manage and handle but also makes failures less prone to happening since there are no numerous wires required to make the system work as it should. This is therefore another reason you should consider this company when you are looking for PRI phone service providers. Handle data, voice, image, video, telex, and fax. Handle wide range of Transmission speeds (64K /128K), 5 to 6 times faster than analog lines therefore lower usage cost. Few pairs of copper, hence higher reliability. Control Internet usage by allocating band width on a pay and use basis. Enjoy the benefits of instant access on voice and Net. A PRI circuit assembly is two pairs of copper wires running from the provider to to the PBX (private branch exchange) at the customer location. The line itself is a type of ISDN (Integrated Services Digital Network) line that allows voice, data and video traffic over an amped-up telephone line. The modem interface uses multiplexing/de-multiplexing techniques to carry multiple channels in a single circuit. Each channel offers 64 Kbps for data transmission (computer use). A PRI can also be used to connect two PBX boards to provide additional lines. That means fast switching, plenty of data transfer ability, and tons of flexibility for a whole building full of people doing different things. One PRI line is considerably less expensive than dozens of analog lines. 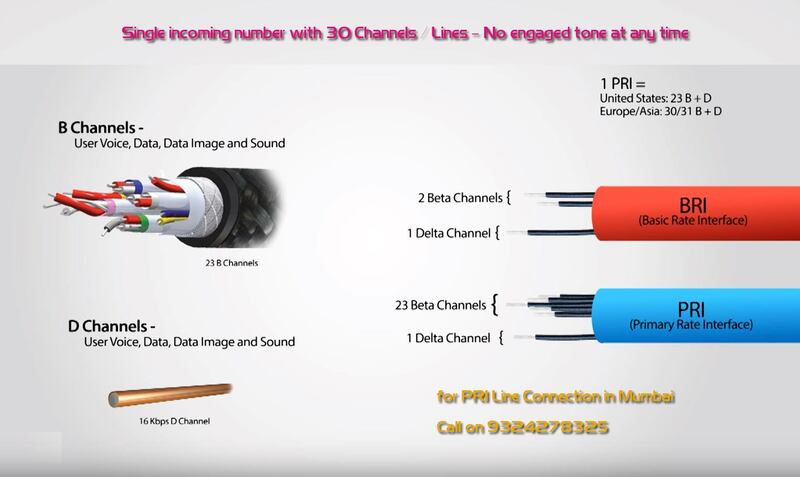 PRI lines offer ultimate versatility; data, fax, voice, and videoconferencing can all be done simultaneously. Digital quality is vastly superior to old-fashioned analog technology. Digital lines are also more reliable and easier to troubleshoot. It is more difficult to tap a digital line. PRI lines offer unique numbers, so there’s no need for a receptionist or those automated phone mazes universally hated by callers. Each line also has a separate caller ID identity. This can be invaluable for a call center, for example, that handles multiple clients. How can a PRI Line Help my Business? Installing a PRI line for business has a number of benefits, but the most visible result is the professional impression your business will make on clients, business relationships, and investors. Even a small business can maintain a professional edge by avoiding the pitfalls of poor response due to poor equipment. There’s nothing more frustrating for a customer or an investor than not being able to get through. Your customer service will improve, and that’s a proven path to a healthier bottom line. Today’s customer has had it with poor corporate response. If you don’t answer, they call somebody else…and you lose the business, potential future business, and the recommendation. In the communications age, you simply can’t afford bad press from disgruntled customers. Reputation is everything. PRI lines also increase the productivity of your staff, with faster uploads, downloads, fax capability, internet speeds, and the ability to hold video conferences with other employees and remote clients, vendors, contractors, investors, or business partners. Remember those days of waiting for the fax line? We’re done with that. We’re digital now. Interested in installing a hosted phone system for your business? Call us on +91 9324278325or Contact us today to get started! ready to bring your AUDIO to life? let's chat on 91-9324278325 and schedule a complimentary consultation with us today! With over 18 years of solid experience in SEO industry, I strategize to give sustainable results custom-fit for your website. I am Online Marketing Specialist in Mumbai Borivali Goregaon Mulund Ghatkopar Andheri specialize in technical organic SEO search engine optimization services, from Panda optimization to penalty recovery, site audits to site architecture consulting. I bring to the table skills not only in SEO, but also significant business management and startup experience as well as extensive programming experience. Hiring an SEO Specialist Mumbai Borivali Goregaon Mulund Ghatkopar Andheri (India). I have done seo on websites using CMS Platform technologies like Joomla, Wordpress, Oscommerce etc.